I got an email from someone who recently started chanting 15 minutes a day. They said the first few months they saw lots of changes...it felt like miracles were happening...but now, the benefits have slowed down for a time and they don't see any changes. My first response is to keep going and do not give up. My second is to say fight even harder for your life! When you are not seeing huge benefits coming forth you are still getting results from your practice. I'll explain how it works. There are two kinds of benefits, the kind you see right away, Conspicuous benefits, and the kind that go deep into your life creating fortune just when you need it, called Inconspicuous benefits. You are getting both kinds every time you chant. It can be frustrating to think "I'm chanting and nothing is happening" but that is really not the case. Seasoned buddhists know exactly what I'm talking about. The fortune from chanting is building a daimoku bank for you. Those inconspicuous benefits will emerge from your life just when you need them...at a crucial moment! I remember in the early days of my practice...in the first year or two. I spoke to a senior leader (one who'd been chanting much longer than myself) about an aspect of my life I was challenging through my prayer. I think it was job related. She compared my life to a glass of water that had dirt in it. She said we easily stir up the dirt at the top when we first begin chanting, but to get to the dirt (karma - things we want to change) on the bottom we had to really dig deeper. That was the day I sat down on a bright and beautiful day and determined to chant 10 hours to change this suffering. Believe me...I saw changes right away after that. I felt like I was walking on air for days. The person who wrote me the email said they'd been chanting 15 minutes a day for some time. I think 15 minutes a day is great, and your life will tell you when you're ready to chant for longer periods of time. Perhaps that is what this person should do...increase their level of daimoku. And study! And go to as many meetings as possible, and encourage others to chant. If your benefits slow down...that is the time to dig deeper, go further, be even more determined than ever you show proof of the power of this practice, and don't give up!!!! How do you chant when you really don't know what to chant for? What if you feel stuck and there doesn't seem to be a good solution...at least one that you can think of? You can chant to open the way forward and keep increasing your capacity to help more and more people. I chanted to increase my capacity and my territory was expanded three times at work. I am making new friends and have the chance to use my talents on two new campuses. And through this transition I am focusing on several things. The first is to honor and praise my life. My drive time is over a half hour to these new campuses, so I'm chanting an hour before I leave and then all the way in the car. The second is to open the way forward into my expanded capacity to fulfill my vow as a Boddhisatva of the earth. I don't have to know this very second how it is all going to turn out. I just have to keep focused on fulfilling my vow and moving forward every day...seeing my district members grow, and hearing from the readers of this blog. I am interested in you. Do you have things you would like me to write about? Do you have experiences you would like me to share on the blog? Do you have questions? Please let me know. This blog is for YOU. The purpose of this blog is to give you hope....to keep that fire burning in you --- even when it seems like everything is rising up against you. Hope is the most important thing. It is important for me. It is important for you. It is important for all those around you that you maintain hope! I hope you enjoy this poem as much as I do. I am reading it over and over as I face the challenges in my life! Daisaku Ikeda wrote this for us on January 2nd, 2012...his 84th birthday. only to be lost later on." left with naught but regret. which shine with such promise! a jewel that inspires and uplifts. we will never be deadlocked. It always gives its best. of those who accumulate unseen virtue. even in the darkest gloom. even hell can be enjoyable." without a cloud of regret. the sun of limitless hope. The mystic law is the source. A boundless state of life! Faith and practice are the key. all together may attain the Buddha way." and be the ones to create new hope! to one person after another! "The greatest hope for the future lies in Soka youth." the golden light of hope! live out your lives with hope! As Nichiren Daishonin says, the treasures of the heart are most important of all. This is the Valentine I received today from my sweet Benjamin who is a freshman at Miami University of Ohio. What beautiful words from my spectacular boy. I love words more than anything...more than flowers (well, I love flowers too) and more than almost anything else! Hi, I feel so fortunate to have found your blog.~! "What does Nam Myoho Renge Kyo mean?" often. You help me to stay focused. & I went to the meeting/service today = Sunday. I'm excited to be embarking on a new journey. like 2X /day for at least 10 minutes. I learned how to chant "Nam Myoho Renge Kyo"
that they did at Center this morning. Here's my experience live and in person! Listen here~! I gave this experience this evening as encouragement for the upcoming Women's Division Victory Meetings. Go to SGI-USA.org to find the local victory meeting by you. The Clear Mirror Guidance from Daisaku Ikeda to Share with You! This is the month we traditionally reread, reread and reread the Clear Mirror Guidance from Daisaku Ikeda. So I've attached it here for you! Although Daisaku Ikeda originally wrote this message for women. It is for us all. It brings the law of cause and effect to life. Enjoy! Click Below for the Clear Mirror Guidance...absolutely fantastic!! Enjoying my life! 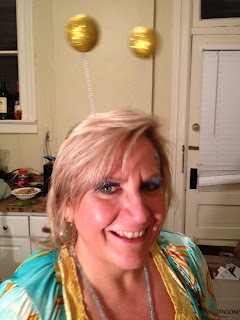 I went to an "Alien" party this weekend...see the antennae? I think I was just BORN to wear them!!! Today begins a bold new journey of expanding my capacity. I am taking on two new campuses as part of my job responsibilities. Today I go to the campus in the northern part of the Chicago Area. I will be meeting my new team, and have various responsibilities and events I intend to fulfill with them. ALL POSITIVITY !!! No complaints! "When One sun rises everything is illuminated"
Today I am also thinking of the magnificent Gene Marie O'Connell. She was my chapter leader in the SGI when I was a "baby Buddhist" in San Francisco. I personally saw her rise from the ranks of nursing student to nursing administrator to CEO of the largest hospital in San Francisco...the one responsible for helping everyone in the city. She constantly asked herself "What would President Ikeda do in this situation?" Every day. She was, and still is, an inspiring example of what is possible when you are determined to manifest your own Buddhahood at every moment of every day. Thank you Gene! That is how I set out today...with the sun in my heart...with Daisaku Ikeda at my side. I wish you all a magnificent, powerful, fulfilling day!!! What is this Blog about? Happiness...Buddhahood! If you're a returning reader welcome back, and if you're a new reader let me give you a taste of what this blog is all about. This blog is all about revealing your own life as the life of the universe with all its power and majesty. It is, according to many, the truest form of Buddhism that exists. There are no intermediaries...no priests...no rules and no one telling anyone what to do. It is based on the deep desire for the happiness of all people, based on each individual taking responsibility for their own happiness. ~~Again: I devote my life to the mystic law of cause and effect through sound vibration. It is the name of the rhythm of life itself...the same rhythm that turns the tides...moves the seasons...pulses in us and in every single thing at every moment of every single day. It is a literal calling forth of the name of the rhythm of life. You know how important it is to call something by its name. If you don't use its name it won't respond. Well this is the name of the law of life itself...the law of cause and effect. When you chant these words you tap into the power that is within you in a very profound way. This morning I attended a meeting with my two new friends who just started chanting. They both told the rest of the group about the way their lives have been going since they started chanting...both of them talked about being in rhythm...naturally...and attracting just what they need at exactly the right moment. One is a healer/physician/surgeon. The other is a musician/songwriter/computer genius. It is so exciting seeing their lives expanding and growing...increasing in capacity...expanding to all that is possible. They loved attending this gathering of SGI Buddhists. When we practice together our benefits expand exponentially. Please give yourself the gift of attending SGI meetings and getting to know your new friends! Go to SGI-USA.org to find your local center, give them a call and get connected to someone by you! Two More Comments! Thank you for Writing! "Thank you for such inspiration! It's when I need it most that you reach out unknowingly and help me. "Its amazing how you encourage so many people across the globe by sharing ur daily experiences. I am tania from delhi practicing from last 5 years. Keep writing!! All the best in life. " These emails make me so very happy. You know we all like to think that what we do makes a difference. And I think about you all the time, my blog readers. I wonder what I can say that will inspire you when you feel lost. I am so lucky. I have great friends in faith who can encourage me. I pick up the phone and call Kate in Los Angeles. I've written about her quite a bit in this blog. I also talk to my friends close by. We all need a touchstone...someone who will be able to give us that extra insight we need so that we will return to our altars and chant through our tears and determine, once again, to root our the cause of our suffering. According to Daisaku Ikeda and Nichiren Daishonin the cause of our suffering is the ignorance of not knowing we are Buddhas, of not accessing our power, of not demanding our happiness. So I remind you once more that happiness and Buddhahood are who you are. This practice is a process of revealing your own beautiful self! It is not easy but you must persevere for yourself, for those who love you and for all those unnamed people standing behind you waiting for YOU to BREAK THROUGH and open the door so that they can be free also. Do not hesitate. Be strong. Whenever you just don't "feel like chanting" please remember that that feeling comes from the inner part of you that doesn't want you to advance in life. Face it down and say "I will! I will advance! Inner darkness you can't stop me!" Be strong and remember that "A sword will be useless in the hands of a coward." Then return to your altar, your "home" and sit down and pour your heart into your determination to be an example, a shining light for other, that this practice works! Don't give up! And you are not alone. If you haven't already reached out to your Sokka Gakkai family please do. You can find SGI centers in almost every big city. In these centers are people who are chanting to meet you and encourage you with their lives, and welcome you into their homes. Give them a call! Make their day! And, as always, I consider it an honor for you to be taking a moment to read my blog. My goal is to inspire you to become the happiest person ever!...brimming with life and enthusiasm...and when challenges hit you, just as they hit me, we forge together, along with President Ikeda to achieve VICTORY in our lives. February is the month of Victory! Let's do it together! Please continue to write! It warms my heart! And also, please pass along the url chantforhappiness.com to anyone and everyone. Please share in my vision for people searching the internet to discover the happiness they seek! It is so easy to blame our environment for our unhappiness and discontent. But as President Ikeda says in "On Attaining Buddhahood in This Lifetime"
"Grumbling and complaining are the principle gateways leading to general doubt and disbelief. Even if we know that such behavior is wrong, we may find ourselves doing it in spite of ourselves. Should grumbling and complaining become habitual it will act as a constant brake on our growth and cause us to forget about advancing and improving ourselves. When that happens, we effectively close off our own potential, falling into the path of seeking the law outside of us." Grumbling and complaining takes many forms. For me, it tends to manifest as depression and hopelessness. This morning, in front of the Gohonzon I vowed one more time to change the karma at the root of my suffering. I don't have to know the details of this karma...I just have to chant to defeat it, and not let it defeat me. Please remember that whatever is going on in your world is YOUR OPPORTUNITY to grow. Putting the fault on your environment is easy. But not helpful! You are a Buddha. Dig deeper. Get to the root source of your suffering. You do not have to figure it out. Just chant to change it. "Because our practice of faith is aimed at attaining Buddhahood in this lifetime, it is absolutely essential that we have a solidly focussed mind or attitude when chanting Nam-myoho-renge-kyo. It is like trying to shoot an arrow: without a clear target, we will not draw the bow with any real energy or determination. In the same way, our prayers can only be realized when we replace vague yearnings with concrete determinations and confident daimoku to definitely accomplish what we hope to achieve."